He received his elementary, preparatory and secondary education in the refugee camp schools, followed by a scholarship to study medicine in Cairo, Egypt and a diploma in Obstetrics and Gynecology from the Institute of Obstetrics and Gynecology at the University of London, UK. From 1997-2002, Dr. Abuelaish completed his residency in at the Soroka University hospital in Beer Sheva, Israel followed by a subspecialty in Fetal medicine in Italy and Belgium, and a Master’s in Public Health (Health Policy and Management) from Harvard University. He is the first Palestinian doctor to receive an appointment in Medicine at an Israeli hospital. Through his work he has had the opportunity to experience the impacts of conflict in countries like Palestine, Egypt, Israel, Uganda, Yemen, Afghanistan, and Saudi Arabia. Working as both an insider and outsider to conflict led him to consider doctors as peace-makers by the moral doctrine of their profession. His work as both a healthcare practitioner and a peace advocate mobilizes health as a tool for peace. Dr. Abuelaish has been an important figure in Israeli-Palestinian relations for years, working in Israeli hospitals, and treating Israeli and Palestinian patients with the full belief that health is an engine for the journey to peace. 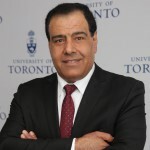 Dr. Abuelaish has overcome many personal hardships, including poverty, violence, and the horrific tragedy of his three daughters’ and niece’s deaths in the 2009 Gaza War. He continues to live up to the description bestowed upon him by an Israeli colleague, as a “magical, secret bridge between Israelis and Palestinians”. He is now one of the most outspoken, prominent and beloved researchers, educators and public speakers on peace and development in the Middle East. Despite his personal losses his doctrine is that hate is not a response to war. Rather, open communication, understanding, hope and compassion are the tools to bridge the divide between Israeli and Palestinian interests. Dr. Abuelaish’s impact on peace-seeking communities is exceptional. He has been invited to give speeches at the Canadian House of Commons, the American Congress, the Chilean Senate and Parliament, the European Parliament at Place Du Luxembourg in Brussels, Belgium, the State Department, and Forum 2000 in Prague. He has been interviewed by major media outlets and personalities in dozens of countries including interviews with Christiane Amanpour, Anderson Cooper, Sir David Frost, and Zeinab Badawi on various media sources including BBC News Hard Talk, Fox News Channel (FOX), Al Arabiya News, London’s The Telegraph, ABC, TVO, The Globe and Mail, The Economist, The New York Times, Vanity Fair, the Boston Globe, People Magazine, and CNN. In addition, he has given speeches all over the world in academic institutions, universities, and organizations in Canada, USA, Europe, Africa, and Austral-Asia. He has received a number of awards and nominations in recognition of his promotion of peace through health, and has been given seven honorary degrees from the University of Manitoba, Victoria University, Sault College, McMaster University, University of Saskatchewan, Queen’s University, and The University of Western Ontario. In addition to sharing the stage with several Nobel Peace Laureates such as Senator Romeo Dallaire, Dr. James Orbinski, Shirin Ebadi (Iran), and Leymah Gbowee (Liberia), he has been nominated three years consecutively for the Nobel Peace Prize, and support for his candidacy keeps growing exponentially every year. He is the recipient of the Stavros Niarchos Prize for Survivorship, and was also nominated for the Sakharov Prize for Freedom of Thought. Since 2010 Dr. Abuelaish has also been named one of the 500 Most Influential Muslims by the Royal Islamic Strategic Studies Centre in Amman, Jordan for three consecutive years, and was the first ever recipient of the Mahatma Gandhi Peace Prize. The impact of conflict on social indicators of health in the Middle East, Access to medical care and quality of care in Gaza, Environmental indicators of health, Defining disease; socio-economic, environmental and cultural factors affecting what we call disease, Defining hate, its degrees and its origins.